Sorry but I think this is a case of fabric-gasm. 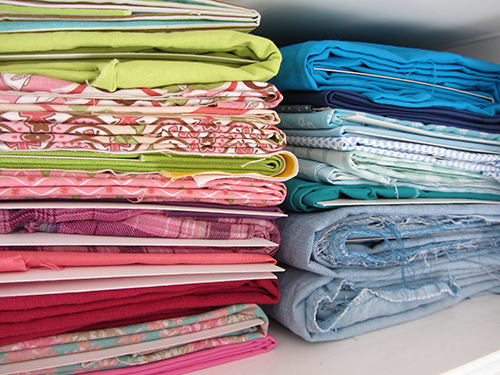 Look at my fabric all neatly folded in stackable little bundles. And yes: they are all the same size. 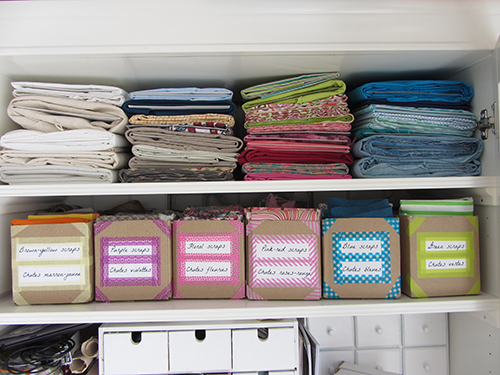 And do you love how the fabric colours match the scraps ones (card boxes on the second shelf)? Me too! I don’t own as much fabric as I thought (hence less guilt!). It took me a while to really get to it because I didn’t know how to proceed. Here I have to thank Pinterest and the quilting community: a common fabric storing system involves comic boards. These are board pieces initially meant to safely store comic books along with matching plastic bags. They are strong and archival safe. So I got a bunch of them (around 50) and used one for each piece of fabric larger than a fat quarter. It is very easy to use. Depending on the width of the fabric, you need to fold the length into two or three. Then you just have to fold around your board and secure the end with a pin or two. I wish I had done this before, it feels so good! What should I organise next? Ribbons, embroidery floss, buttons?